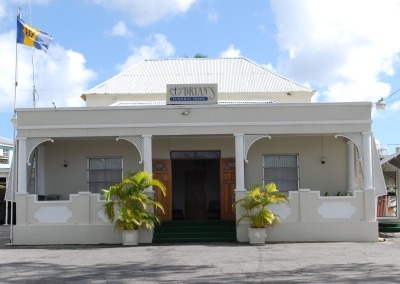 BRYANS FUNERAL HOME LTD was established in October 1990 at its present site in Belmont Road, St. Michael which was formerly Hinds Funeral Home. The company has been providing efficient and reliable funeral and cremation services for families all over Barbados and beyond. Bryan's Funeral Home is also closely associated with many other funeral directors on the island all sharing the equal commitment to providing the best service to families in their time of need. Part of our services is providing quality made caskets from both local manufactures and imported Canadian wooden caskets to suit everyone's needs. We also offer assistance and guidance in the purchase of burial spots at the cemetery of your choice. We provide a 24 hr service in both the area of Funeral /cremation services and taxi and transfer services. We provide funeral coaches, flower vans, cemetery lowering devices, tent and chairs, chapel facilities, full mortuary services, refrigeration storage facilities. We are also located very close the Queen Elizabeth Hospital, Westbury Cemetery and the registration department. Our experienced and reliable staff, most of whom have been with the company for over 10 years are all very knowledgeable and respectful in caring for the needs of all families in their difficult time of funeral arrangements.